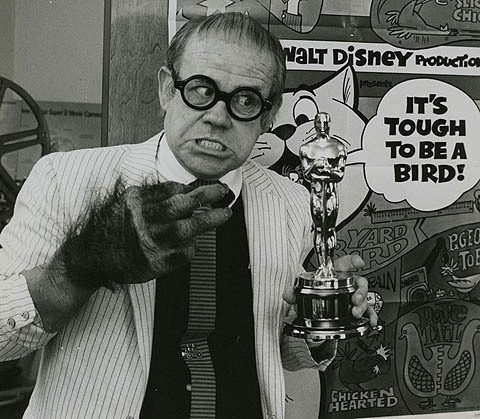 Ward Kimball, one of Walt Disney’s nine old men of animation, was never a perfect fit for the organization. While he was as good a draftsman and animator as any, he was also an iconoclast. He was too individual in his dress, his hobbies and his attitude to play the role of company man. Within the studio, he was both admired and criticized, but Walt Disney valued his talents enough to put up with his idiosyncrasies. The Life and Times of Ward Kimball by Todd James Pierce is the first full-length biography of this multi-talented man. Pierce goes beyond Kimball’s work at Disney to relate Kimball’s interest in vintage transportation, jazz, and fine art. 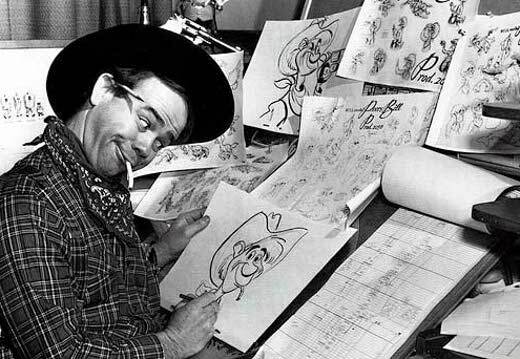 While the Disney studio was central to Kimball’s life, it wasn’t enough to satisfy his energy or curiosity. He restored a Model T and several full-size railroad engines and stock; he formed several jazz bands, performing in Los Angeles-area clubs and on radio and TV; he created kinetic paintings for gallery shows; and he made one independent animated film. Pierce had access to Kimball’s diaries, giving him an inside look at how Kimball saw events. He goes into great detail on Kimball’s view of the Disney strike and his changing status in the studio over several decades. He covers Kimball’s trip with Disney to the Chicago Railroad Fair, a trip that strengthened their personal relationship. Kimball’s shift from feature animation to TV during the 1950s is given detailed attention, especially the creation of the “Man in Space” episodes of the Disneyland TV series, both for how they broke away from the standard Disney animation style, their scientific accuracy and their effect on the U.S. space program. Kimball’s love for New Orleans jazz led him to jam with other artists at Disney, giving lunchtime concerts and playing local dances. It eventually led to the creation of the Firehouse Five Plus Two, which had a brief national success limited only by the fact that the musicians were not willing to abandon their Disney studio jobs to go on tour. Pierce has done an excellent job but the book has one major flaw: the complete lack of illustrations. The Disney studio is infamous for requiring approval of works before they allow images to be used, so it’s no surprise that the book lacks Disney illustrations. Truthfully, anyone interested enough to read a Kimball biography undoubtedly has examples of his Disney work elsewhere. However, the book features no photos of Kimball and his family, no images of his art outside Disney and no photos of Kimball’s antique vehicles or jazz bands. While Pierce was not writing an art book, the biography of an artist cries out for some images of the artist’s life and work. The book does such a good job of expanding a reader’s knowledge of Kimball that it’s a shame that there are no pictures to further flesh it out. Even so, this book is essential reading for anyone interested in Disney history or Kimball himself. Kimball is a worthy subject and Pierce has done justice to the full range of his many accomplishments. What happened to Amid’s book?Did it go unpublshed by the second publisher? I know Disney didn’t approve of Amid’s first draft…….. According to Twitter (@wardkimball) Amid’s book is due out this year. I guess I’ll wait & see the reviews for that one before potentially purchasing any. While any book may be well-written and researched, illustrations are as essential to a book about an artist as is text. A picture is indeed worth a thousand words. Disney didn’t approve of any drafts of Amid Amidi’s Kimball biography. 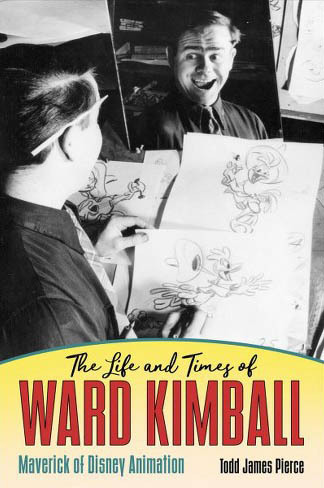 That’s why Amid is now writing his account of Ward Kimball’s life and career for a different publisher, without Disney’s consent or any Disney-owned artwork. 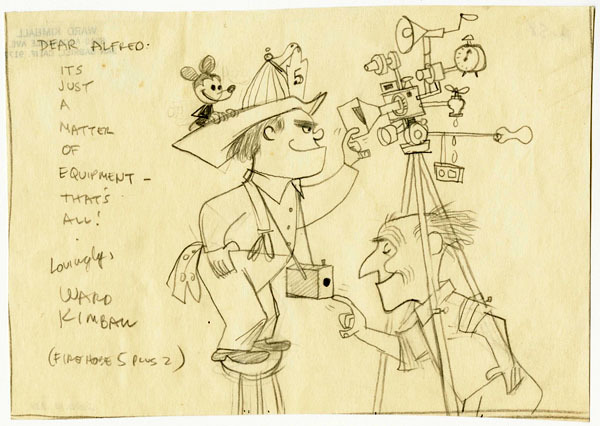 I wish somebody would make a documentary about Ward Kimball similar to the documentary Frank and Ollie about Frank Thomas and Ollie Johnston. Mark Mayerson has worked as an animator, writer, producer and director in TV animation for over 30 years. Among his accomplishments he created the cgi series Monster By Mistake. Mayerson holds a Masters degree from York University in Cinema and Media Studies and is currently teaching animation at Sheridan College. Mark Mayerson can be contacted at mark(dot)mayerson(at)sheridancollege(dot)ca.